Registration materials have been mailed to returning players. Registration forms are also available on our website for new and returning families. Late registration and tryouts were held on Jan. 10 at Premier snack stand and Begg North field, respectively. It is very late, but for t-ball, baseball coach-pitch and softball kid-pitch, you can still register by downloading the forms and mailing them in immediately. New registrants need to include a copy of the player's birth certificate or passport for proof of age. 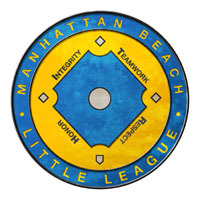 Registration is closed for kid-pitch baseball and coach-pitch softball leagues and if you managed to squeak in at the last minute, you are probably on a waiting list. Teams will be formed by mid-February. Please don't call the hotline to determine which team your kid will be on. A manager will contact you in February. Manager meetings and manager training will be sprinkled from late January to the third week in February. First practices will commence around the third week in February. Opening Ceremonies and Parade will be held on March 13, 2004.